Encourage the insect community into your garden with this multi specied insect hotel. Europe is home to hundreds of insects and certain species are threatened by changes to their natural habitat. 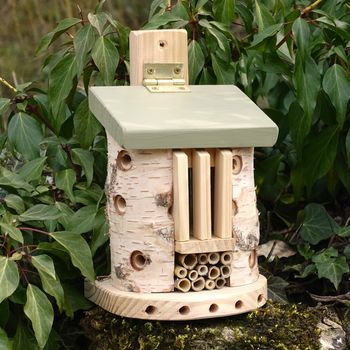 This wooden insect hotel will shelter solitary bees, lacewings, ladybirds and hundreds of other beneficial garden insects over the winter as well as encouraging them into your garden to pollinate your flowers and feast on aphids that would destroy them. Simply place in a sunny but sheltered spot and sit back and observe the hotel in action! This insect hotel, already a favourite with lots of children would make a unique gift for your nature loving friends. Its textures, crevices and hollows will attract ladybirds, lacewings, solitary bees and over-wintering butterflies too.